Last month I blogged here about Tom Doyle's "Plant & Pick" Vegetable Gardening System. 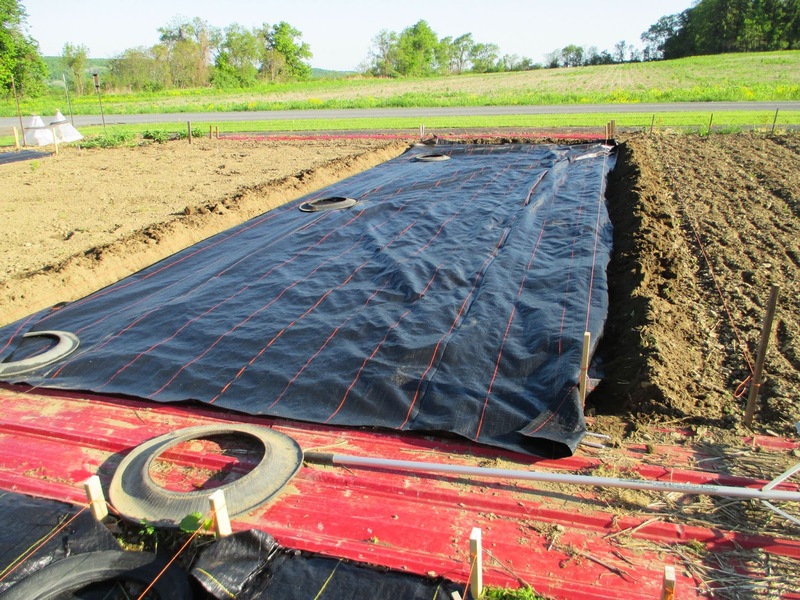 I mentioned that he wrote a book about gardening by planting in rows of small holes in large sheets of black plastic. I finally got a copy of the booklet and I'll post a review of it here soon. But before I received the book I went ahead and bought a roll of 12-foot-wide Long Lasting Plastic Mulch to try making some permanent plastic-covered sections in my garden. The picture above shows the first piece of plastic going down. I dug a 6" trench around the perimeter to bury the edges of the plastic. Where the plastic came up to my sheet metal walkway, I just tucked it under the metal. 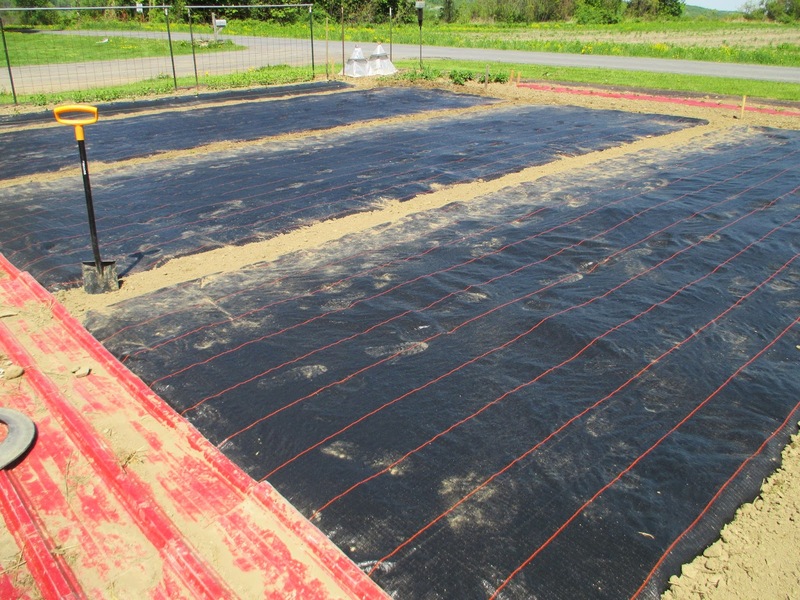 The picture above shows the first sheet of plastic mulch in place. It is 10' 6" wide and about 30' long. I spaced the three plastic-covered sections apart 12". That Fiskars flat-blade shovel visible in the above picture is the tool I used to dig the perimeter trench for burying the plastic edges. I've learned from previous experience with this woven plastic that if it is cut with a knife it frays. It has to be cut with heat so the edges melt. 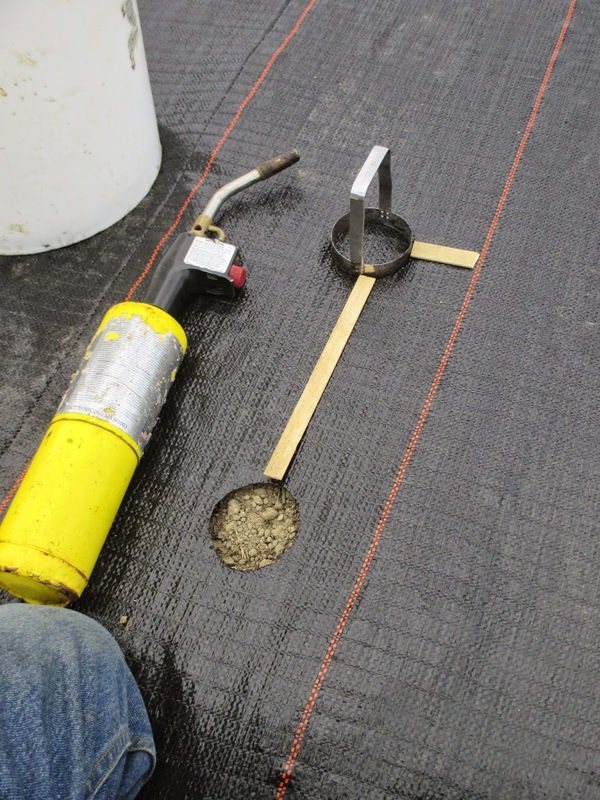 I used a propane torch to heat up a 3" diameter biscuit cutter to make the rows of planting holes. The plastic has lines on it, which help with keeping the rows of holes straight. I used little sticks of wood, as shown above, to help space the holes at 12" on center. Melting holes with a biscuit cutter and torch is tedious. 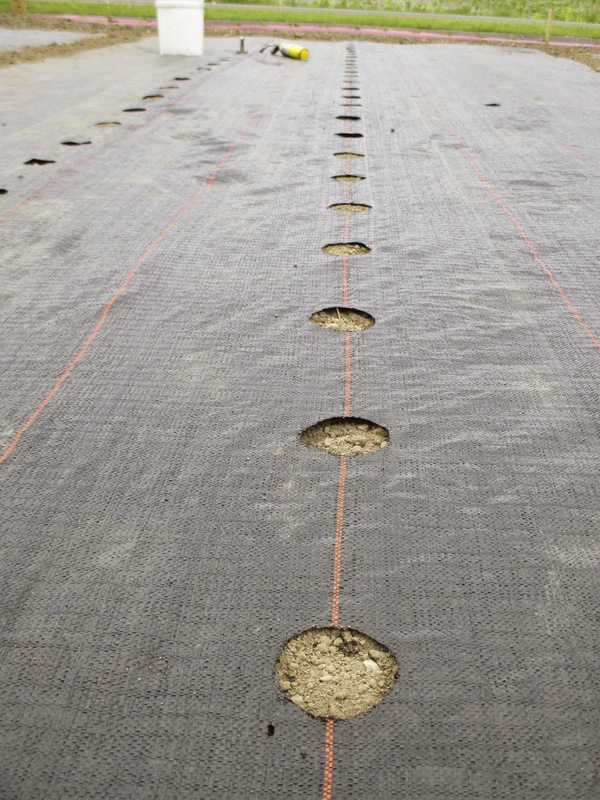 The rows of holes are spaced around 28" apart. I have five rows of holes per sheet of plastic. I will keep you updated on how this idea works. What are your thoughts on wood or other mulch? We've had great success with mulches preventing weeds and they seem to really help the ground stay moist and not compressed. Currently we are using local tan bark mulch from the municiple compost center. It is pretty well composted and works great. Have you seen Back to Eden garden? Yes, I've seen Back to Eden. The garden writer, Lee Reich has been using wood chip mulch for years. I think any mulch over the soil is a good idea. Hay, straw, sheet metal, wood chips, carpet scraps, newspaper, and even black plastic. My current attraction to plastic comes from the realization that I just don't have the time to be gathering and/or hauling and spreading natural mulches over my entire garden. And then there is the slug problem I've had with natural mulches. I think there is no one right way to garden. Gardening is a continual process of trying new ideas, evaluating them, and coming up with different systems that work best for you and your particular soil, climate and life situation. You can just use the torch, it will burn a round hole. No need to heat up the branding iron. Practice a little bit on scraps to figure out how long to do it to get the size of hole you want. I tried that and it made an oversize, lopsided hole. But I didn't try it on a scrap to develop a technique. I'll try again. Thanks. Never worked with plastic mulch. Is it porous enough to let rain through before it runs off? I agree there is no one right way to garden. I live in the city and plant in pots and in my front yard (much to the despair of my neighbors). As you mentioned, I have learned a lot over the years and have found what works for me. If you are new to gardening just get out there and start. Just trust your God given common sense to figure it all out. Yes the plastic is woven and therefore somewhat porous. This is experimental on my part and based on the method of gardening promoted by Thomas Doyle. The question of fertilization is my biggest question too. I'll be blogging about what Tom Doyle had to say on this subject. Most people will find it a little odd. I plan to fertilize with foliar sprays and bucket fertigation solutions. In future years I will add compost and some organic fertilizer (i.e. kelp & cottonseed meal) to the planting hole. I really like this idea as my garden is a disaster this year because I just don't have time. I think I will buy a 4 or 5 biscuit cutters and have my son keep them hot with the weed torch while I cut the holes. I kept some tin on the soil for 1-2 months and was amazed at how soft and black it look when I tilled it. Hello Mr. Kimball - was wondering if you'll be posting an update here on this post or a new one with an update on how you're finding this method worked now that we're getting into Spring. How did it work out? Are you going to use it again? Is there a follow-up post that I missed? 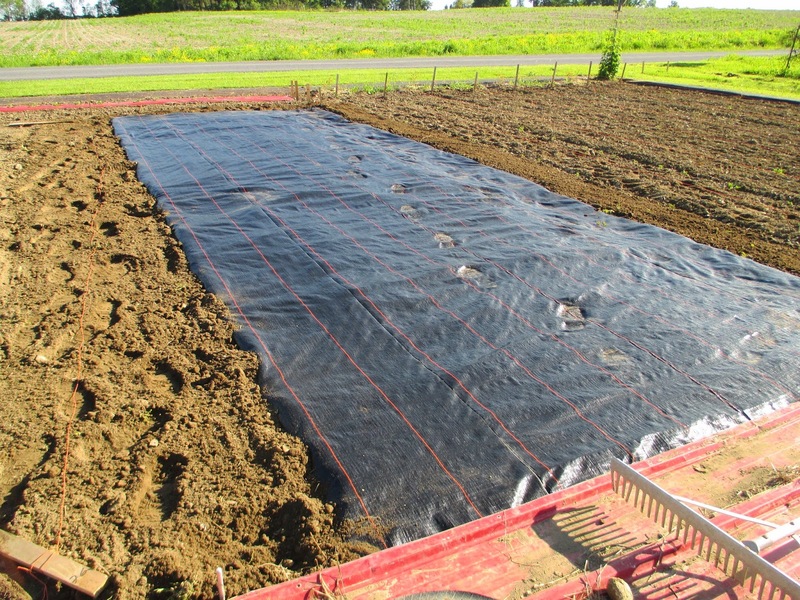 When I moved here there was some similar sheeting that was used for erosion control while the house was under construction that was rolled up. I have kept it stored thinking it could be of some use some time. Viola!!! Mr. Kimball to the rescue AGAIN!!! I'm wanting to make some new garden beds with it and was wondering about your results. Thanks for all the good info and we NEEEEEEEEEEEEDDD (whine) more garden videos from you this year if you can spare the time! Was wanting to order some of the whizbang notepads but alas it is spring and my gardening dollars are spent at this time. I'm sure many gardeners can relate. Perhaps I should put them on my Mother's Day Gift wish list? Thanks for asking about the plastic in the garden idea. I never followed up with another post and hope to do so very soon. In short. The idea worked very well for us, especially with cucumbers and squash and chard. The plastic is still in place and planting through the holes will be very easy when planting time rolls around again (very soon). Does this stay down permanently and if so, what about crop rotation? Also, how do you water the plants? Seems like it would take a lot of effort to get the water just in the holes without a lot of runoff.